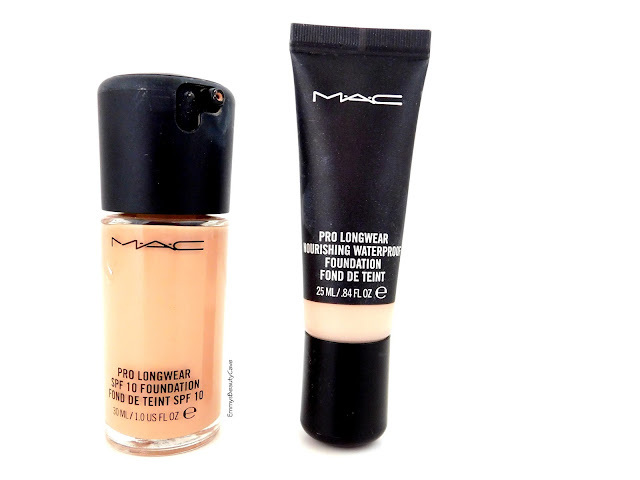 It's the battle of the MAC Pro Longwear Foundations. 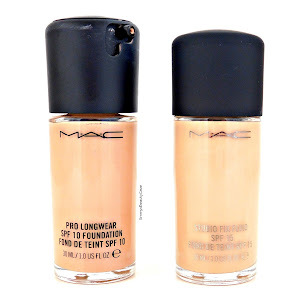 I have tried nearly every MAC Foundation apart from the Mineralize Foundation. My skin is oily around my nose and chin then normal everywhere else. I sometimes get small dry patches on my cheeks. MAC released the Pro Longwear Nourishing Waterproof Foundation so I thought I would compare this against the original Pro Long Wear Foundation. 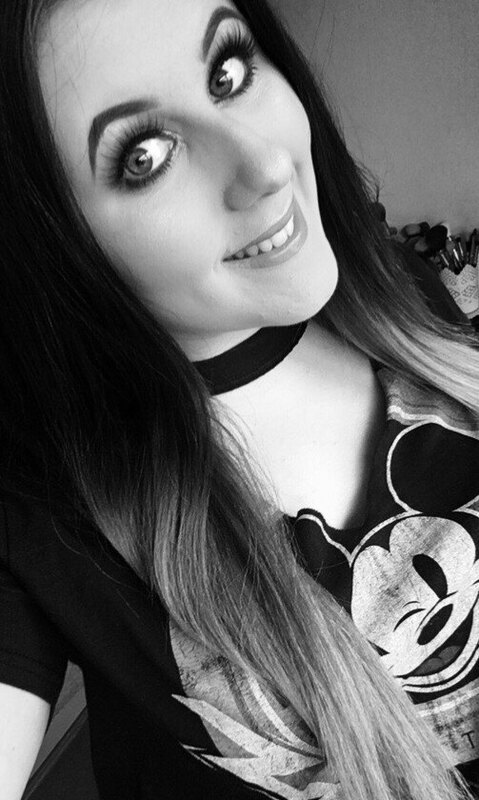 I also compared the Original Pro Longwear Foundation against Studio Fix Fluid Foundation which you can read here. I have used the original Pro Longwear Foundation for quite a few years but as soon as I saw they released a waterproof version I was intrigued and wanted to find out if it was as good or better. Both retail for £26 but you get 5ml less in the Nourishing Waterproof version. The packaging is completely different as you can see. The Original Pro Longwear comes in a glass bottle with a twistable lock pump. The Waterproof one comes in a squeeze tube. Personally I like both, both are quick and easy to use. I do prefer to take the waterproof one if I am travelling as the packaging is lightweight and won't break. If you have tried Studio Fix Fluid which is quite thick these aren't anything alike. Both feel lightweight to apply. The original has a runnier consistency and the waterproof one is only slightly thicker. For me these can both provide medium coverage. I have tried building them up but they don't create full coverage. You can still slightly see my freckles through them. When I use a Beauty Blender it creates quite light coverage with the original Pro Longwear compared to the waterproof one which is medium. If I use a buffer brush you can easily get medium coverage. The original has a natural matte finish, it isn't drying at all and makes your skin look natural with good coverage. It is definitely your skin but better. The waterproof one has a slightly more semi matte finish, it gives your skin an ever so slight healthy glow without being dewy. I find both last just as well as the other. As I am extremely oily on my nose and chin I always have to set the foundation with powder. The best powders for oily skin include RCMA Powder, MAC Studio Fix Powder Plus Foundation and Rimmel Stay Matte. In the warmer months I do have to touch up once with powder and that is it. I don't find either seperate or go patchy, they both stay flawless all day. The waterproof one isn't fully waterproof although if doesn't smudge if you cry or your eyes water. Original | Comes in 22 shades which is good for all skin tones. Waterproof | Comes in 16 shades. 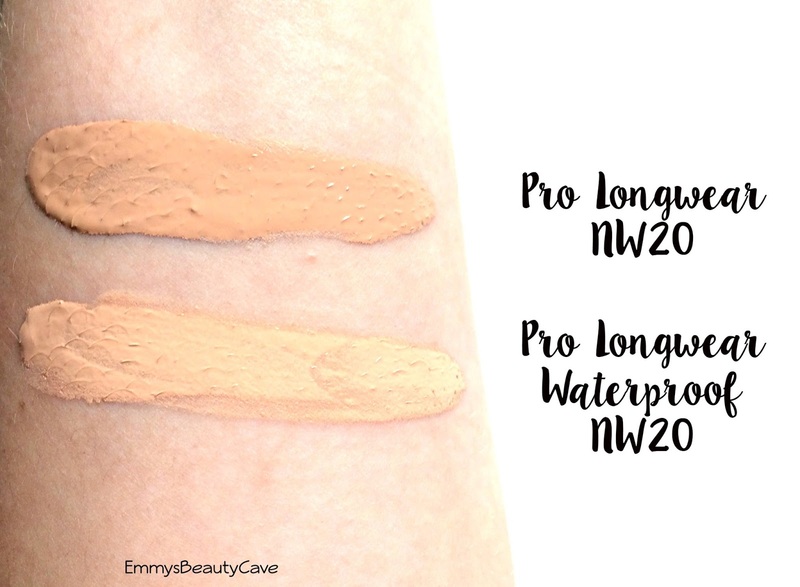 Below I have NW20 in both foundations and you can see the original pro long wear is slightly darker. The waterproof shade matches me exactly so I use the original NW20 when im slightly tanned. Overall they are pretty similar. If you are paler than me I would definitely go with the waterproof version as the shades a paler and more neutral than pink in the NW range. 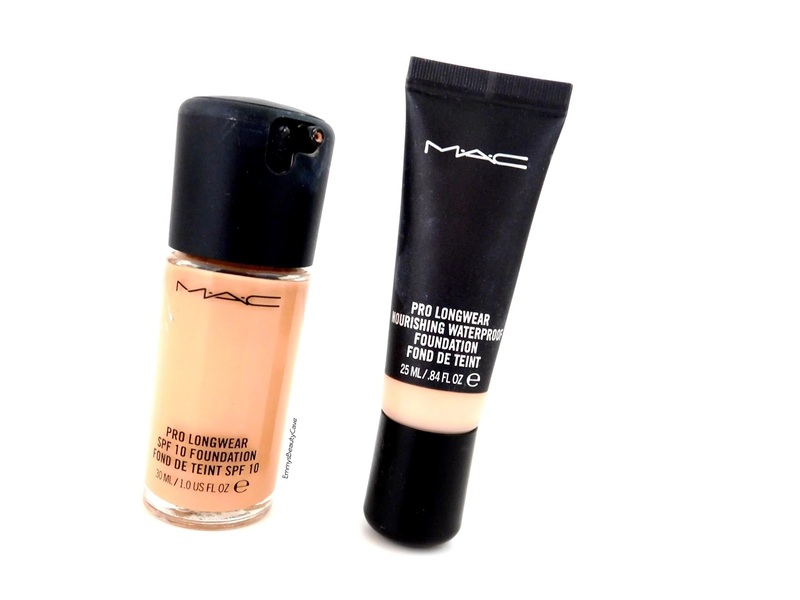 Both will definitely work on combination skin or oily skin types. If you have dry skin I wouldn't recommend them.